Each year as parents throughout Polk County prepare to send their kids back to school, there is a mixture of joy, thanks to having a quiet house for part of each day, but also stress, because the carefree schedule of summer is coming to an end. Strict wake-up and bus pickup times have to be planned for, lunches have to be packed (or money provided) and backpacks must be laid out with completed homework each evening before bed. When you add in breakfast, getting to work, school pickup, extra activities (soccer practice, dance rehearsals, or music lessons ) and dinner, your days can be so full that you barely have time to catch your breath, much less think about laundry and cleaning your home. As you head into this new school year, we have some tips to help you stay on top of cleaning and laundry, so you don’t have to feel the stress of things piling up on top of the evening homework and bedtime routine. Map out a schedule. Literally sit down, and write out a list of each thing in your home that needs to be completed each week (scrubbing toilets, washing school and/or soccer uniforms, cleaning out the fridge) and then break that list into manageable pieces for each day. For example, Monday might be your bathroom cleaning day, Tuesdays you tackle kitchen and living room cleaning, and so forth. If you know what is expected, and when, it makes the job much less stressful since you have a sense of “completion” when you finish a job, instead of always feeling like you have to move onto the next thing. Speaking of schedules, set your laundry up on a schedule too! This is something other members of your family can be expected to help with, as even the youngest children can help with unloading the dryer, and putting their own clothes away (regardless of how neatly they do it). Set up a schedule that works for your family. If you know school uniforms are dirty by midweek, Wednesdays might be a good day to launder all school clothes so they’re ready for the remainder of the week. Wash them again on Sunday night and you’re good to go! The same goes for sports uniforms, towels and bedding, and even your work clothes. Have a “Tidy or Toss” basket. In the evenings, instead of running all over your home putting things where they belong, have a designated basket that you can carry from room to room picking up all toys, papers, remotes, shoes, etc. that are out of place. The basket can be sorted later at a time that’s convenient for you. This prevents clutter from building up on surfaces of your home, and older kids can be responsible for finding their own things in the basket and putting them away. Use a “No More Dirty in Thirty” cleaning system. This is a quick clean process that completes a room in 30 minutes or less by doing a basic, general clean instead of a deep clean. 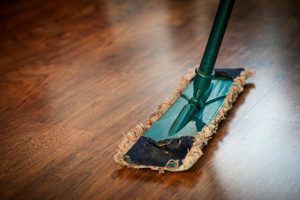 While you’ll still need to deep clean periodically, maintaining things with this system keeps your home feeling under control, and makes the deep cleaning process much easier later on. Clean each room from top (dusting ceiling fans, lights, and high surfaces)) to bottom (vacuuming and mopping) so you don’t have to go over things multiple times. For bathrooms and kitchens, find a multipurpose cleaner that can be used on all surfaces to save time and effort. We hope these tips help empower you to feel less stress this school year. Another way to say goodbye to stress? Let PHR Staffing Solutions take over your job hunt. If you’re currently unemployed, or underemployed, searching for a new position can be tiring and stressful, especially when trying to manage your family as well. We do the hard work for you, so you can focus on what matters. We’ll match you with positions that meet your skills and qualifications, so you’ll be able to head into your first day on the job with the confidence of being prepared. Give us a call to get started or apply for one of our current openings online. Good luck to our students in and around Polk County (and their parents) as we kick off the 2017-2018 school year!